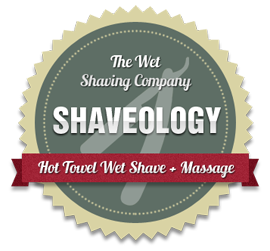 Shaveology is what you get if you take traditional hot towel wet shaving out of the barbershop and mix it with elements of male grooming, and beauty and massage techniques, to create the perfect gentlemen’s treatment. It has been devised by Patrick Bryan, a professional masseur for 20 years and a shaveologist for ten, to include the highlights of the best shaves he’s had in his travels, particularly India and Turkey, and with traditional old school English barbers back in the 1970’s and 80’s. 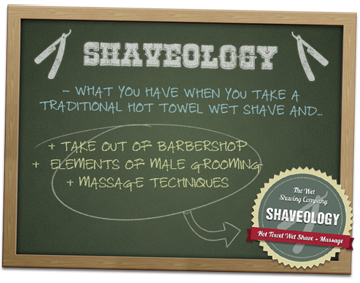 Our shaveologists come from a wide range of backgrounds – massage, beauty, hairdressing and barbering – and we encourage them to use these skills in their shaves. No prior knowledge is required – you don’t even need to be a man! Whatever your present occupation, existing skills, or gender (!) our wet shaving training courses will equip you to perform fantastic shaves, and maintain your competitive edge in your industry. When all the elements of a wet shave (preparation, technique and good tools) are used correctly it produces the smoothest shave with no damage to the skin. Why then have so many men given up on wet shaving? Mostly it’s because poor technique coupled with inferior tools result in a very uncomfortable shave, often leading to razor rash and burn, and even ingrowing hairs. The solution is to go back to basics, take some good advice and invest in some better equipment. The key element to a good shave is the ‘wet’ part! Water, hot water, and lots of it. Wash with water as hot as you can stand it and plenty of soap. this loosens the skin (making it easier to pull taut), opens the pores (pushing the bristles out) and degreases the bristles (allowing them to absorb water and become softer). Lather the face slowly using a good shaving soap or cream and a shaving brush.This traps a layer of water on the skin and in the beard which acts as a lubricant ensuring the razor glides beautifully. Shave the face slowly, going with or across ( never against) the beard growth, whilst holding the skin taut. Rinse the razor frequently to prevent bristles blocking the blades. Rinse the face and then splash with cold water to close the pores. Ensure that razor blades/cartridges are changed frequently. Invest in a shaving brush and a good shaving soap or cream, trust me you will notice the difference. DE (double edge) or safety razors are becoming more popular and, although harder to master, produce great results. If you have any problem with any part of this solution book yourself in for a professional wet shave and get some hands on advice.